A below-par Motherwell side crashed out of the William Hill Scottish Cup at the first hurdle on Saturday when they suffered a shock home defeat to Championship leaders Ross County, writes Craig Goldthorp. It was a nightmare return for the Steelmen, back in action after three weeks away during which they had a seven-day winter break in Tenerife. Of the two new loan signings, Ross McCormack had little chance to make an impact before being subbed at half-time, while winger Gboly Ariyibi played the full 90 minutes and produced some fine bits of skill during the first half. And praise must be given to County, who will surely be promoted as champions this season if they keep playing like this. Two-goal Brian Graham was their main hero but the well organised Staggies looked the hungrier team from the off. Motherwell only really came to life late on and their goal was scored by youngster Jake Hastie in injury time. County started well and Declan McManus's eighth minute volley for County was saved comfortably by Mark Gillespie. Michael Gardyne's 12th minute shot for the visitors was blocked before Lewis Spence blasted the rebound high and wide. County continued to boss the early stages and a dangerous cross from the right on 16 minutes only just evaded Staggies striker Graham. Ariyibi then produced a fantastic piece of skill to create space and bore down on goal. But instead of shooting he passed to Elliott Frear who sent an effort well over. The first glimpse of McCormack as an attacking force saw him tee up Danny Johnson who shot wide with his left foot. But the Highlanders were still matching their Premiership opponents and Aldred's last ditch challenge stopped Jamie Lindsay from turning in a cross to the back post before the resultant corner was met by left back Sean Kelly whose overhead kick went over. Ariyibi produced a superb piece of skill on the left wing before whipping over a dangerous cross and the Nottingham Forest loanee looks a good addition. The second half almost started disastrously for the Steelmen as County's Lindsay was sent clean through on keeper Gillespie who blocked. And the Motherwell custodian was in super form within three minutes as he superbly stopped a low, powerful shot from Declan McManus. But County did go ahead on 52 minutes when McManus's cross was headed in by Graham from six yards. It was the same combination on the hour mark as McManus's cross to the back post was converted by Graham. 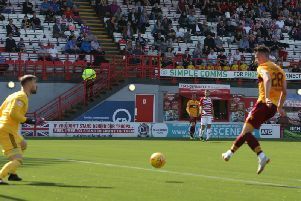 But Ariyibi looked to have been fouled in the build-up and referee Steven McLean was surely wrong not to stop the game and award Motherwell a free-kick. It was almost 3-0 on 76 minutes when Graham shot against the bar. McManus's shot from the rebound was saved. The home fans were becoming increasingly restless with their side's wayward passing. The Steelmen had an 83rd minute chance when Turnbull's corner from the right was met by Aldred whose header was saved. Curtis Main sent a left foot shot just wide in the 89th minute for 'Well. But the hosts did pull a goal back in injury time when Frear's floated cross from the left was headed in by Hastie. It was too late though for 'Well and boos rang out around Fir Park at the final whistle from the disgruntled home support. Motherwell: Gillespie, Tait, McHugh (Gorrin 64), Aldred, Hartley, Frear, Ariyibi, Dunne, Johnson (Hastie 66), Turnbull, McCormack (Main 45).